Everyone procrastinates at some point in their lives. Some, however, are habitual procrastinators. People that are always telling themselves they’ll do a task later or tomorrow. Procrastination is one of those bad habits that can be impossible to break. For some, it may not seem like a big deal to constantly put things off. But for others, it can lead to excessive stress as you rush to get things done, consistently running up until the very last minute. In some instances, procrastination may in fact be perfectly harmless. However, there are times when your procrastination only serves to harm you. Whether that means it affects your relationships, your career, or your finances, procrastination has the ability to be detrimental. That being said, here are 6 ways procrastination is bad for your budget. Procrastination will likely cause you to spend more money in some ways and cause you to rush on saving in others. If that’s the case you’ll be forced to constantly make quick adjustments to your budget to accommodate either unnecessary or poorly timed expenses. By rushing to adjust your budget you’ll not only slow your progress on your financial goals, but may be more prone to making mistakes or miscalculations that could cause you to lose some of your financial stability. No one likes to pay bills no matter what they’re for. However, choosing to procrastinate on financial responsibilities like credit card bills, or home and car payments, only hurts you in the long run. By choosing to put your bills to the wayside until you feel like paying them, you’ll likely cause yourself to pay them late. Late payments equal late fees, which means you’ll end up paying more than you’d accounted for in your budget. Moreover, consistent late payments on various bills could cause higher interest rates, which means you’ll pay more overall. Both consequences are bound to throw your budget off. If you’re a procrastinator at heart, you most likely wait until the last minute to purchase gifts or book travel plans. Whether you’re shopping for the perfect gift or purchasing a plane ticket, earlier tends to be better now than later. The sooner you start looking to do either of these things, the more time you’ll have to shop around. You won’t be on a time crunch, hence you can comparison shop for the best price, search for coupons or discounts, or wait for things to go on sale. All-around you’ll be able to save more money. When you purchase things at the last minute, you have fewer choices and, due to time constraints, may be forced to purchase the first option you find. In any case, you’re bound to spend a lot more, eating into your budget, by procrastinating. There may be many factors that cause you to procrastinate opening savings or investment accounts. Maybe it seems like a lot of work, or maybe you’d like to wait until your more financially well-off, or maybe you made an impulse purchase that caused you to wait to start saving until a later date. No matter the reason, the longer you wait to save up money the more it’s going to cost you. Every day your money is in a savings account is a chance for it to accrue interest, ergo you’ll have more money saved up in the long run the sooner you begin. Putting this off may mean putting of your financial goals and retirement or just might mean you’re a lot less stable than you would have been. Procrastination ultimately hinders your job productivity and sooner or later, even if you meet your deadlines, it will affect your results as well. Anytime you rush to complete a job it’s highly unlikely that you’ll be able to give that project 100% of your effort. It’s in those moments that we are forced to cut corners and hastily and half-heartedly complete our tasks. In the end, your procrastination may affect your career more than you anticipated. It could mean missed opportunities and promotions, ergo affecting your potential budget and savings opportunities. Unless you have a passion for cars or home renovation, the idea of spending your free time doing repairs on either doesn’t exactly sound like fun. Moreover, sometimes even the idea of having to take your car in or sit at home waiting for a repairman can be enough to cause you to put off improvements. Although waiting to repair small things might not seem like a big deal, it could set you back majorly in the future. Sometimes small problems, when they go unfixed, can turn into much larger issues. For example, failing to insulate your windows and doors now, could mean you spend more on your energy bill in the long run. Or a delay in fixing a small engine problem could mean you end up having to purchase a new car sooner. Those seemingly small issues, when forgotten in the moment, can lead to larger expenses. Wen that happens, your budget isn’t often prepared for it. Moreover, this is especially the case if you’ve also procrastinated opening an emergency or savings account as well. Sticking to a budget is a hard enough task in itself sometimes. There are always temptations and things it’d be all too easy to splurge on. 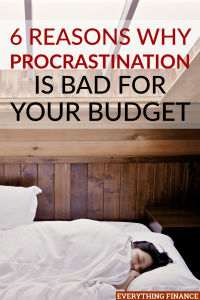 Unfortunately, procrastination makes staying within your budget that much harder. It can cause extra or larger expenses than you’d planned for. It can ultimately set you back from savings plans and financial goals, which makes straying from your budget even more tempting as those goals get farther and farther away. Procrastination only serves to harm you financially, so it’s important to take steps to break that habit once and for all. How has your procrastination affected your budget? What have you done to break your procrastination habit?